2017 “Agate” SOLD OUT. 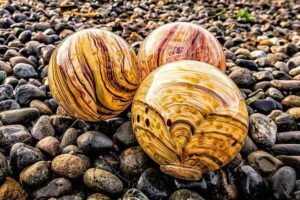 Our annual float to benefit the Museum of the North Beach in Moclips, WA, the 2017 edition is called “Agate.” It has translucent shades of amber and dark red with striations inspired by the banded layers of the natural stone. Float is 4.5″ wide and sealed hot with a button stamped with “Moclips-by-the-Sea.” Half of the purchase price benefits the museum.